Importing your existing contact data into Sentle is a simple process and this article will cover the steps required to cover this. Sentle only requires either a Contact or Business name to create a contact within your database but includes the following data fields as default. We understand that every business has different data that they save against their contact details and as such before you import your data we recommend setting up the required custom fields so you can move your data across accordingly. Instructions on how to set up custom fields can be found in the ‘custom data fields’ article located within the ‘customisation’ section of this knowledge base. Within the Company Configuration area, you will find the option ‘Import Contacts into Sentle’ on the left hand menu as show below. 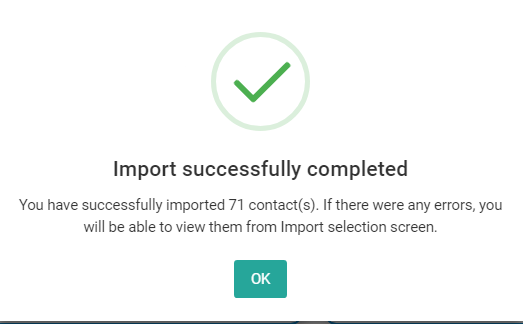 In the same manner as you would add a filed to the Document Management System or an Email with Sentle, use this screen to either select or drag the relevant Contact Data file into the importer. As mentioned earlier, if you haven’t set up the relevant custom fields within Sentle it’s recommended that you do so now before progressing to the next step of this import. In the ‘Assign to’ middle column, you can define which data field with Sentle that the associated information will be added to. This example show the ‘Postcode’ data being assigned. When you are happy you all data mapped and have at least a Contact Name or Business Name assigned, scroll down to the bottom of the page where you’ll find the option to ‘Continue to next step’ via the green button. During this stage Sentle will check your input file for errors (see info below) but if there are no errors detected you’ll be able to continue with processing the import. Before you choose to progress you can do the following. Assign Tags to the contacts: These could be any tags that are currently used in your Sentle system or you could create a new one here. These tags will automatically be added to all the imported contacts. 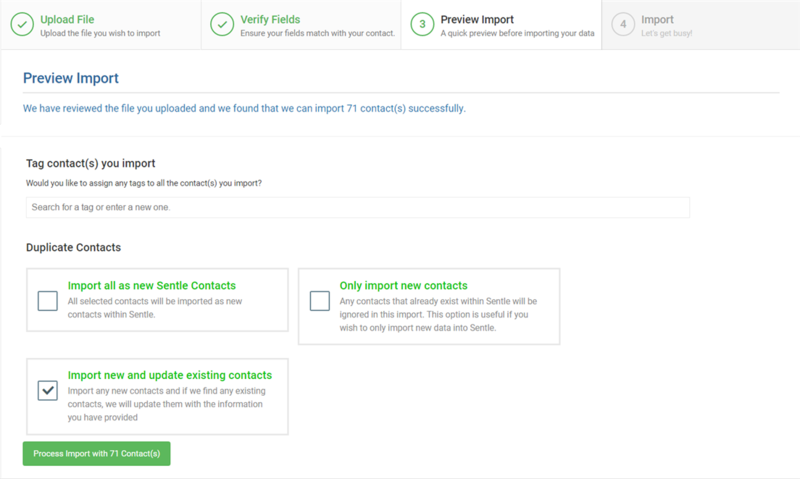 Import all as new Sentle Contacts: All selected contacts will be imported as new contacts within Sentle. Only import new contacts: Any existing contacts within Sentle will be ignored. Use this option if you wish to only import new data into Sentle. When happy, select Process Import and you’ll see a progress screen that once complete with be replaced with the following success alert. If when uploading your document specific contact or company name data was missing you will be presenting with a screen link this during the import preview stage. The contacts with missing data will be shown as above. Double click on the empty cells to add the required data and hit retry and these contacts will be added to the import.